← Make/do: Check out our Final Week! So, what happens when you find a dress you HEART, which is pocket free? Do you stuff the lip balm in your bra? Forego the sweets? Fret not. I have the answer. In a few simple steps we’re going to learn how easy it is to add pockets to most skirts and dresses. 1 – Choose your victim skirt. I will refer to skirts throughout, but the same goes for dresses or culottes (really, though? Culottes? OK, if you insist…). 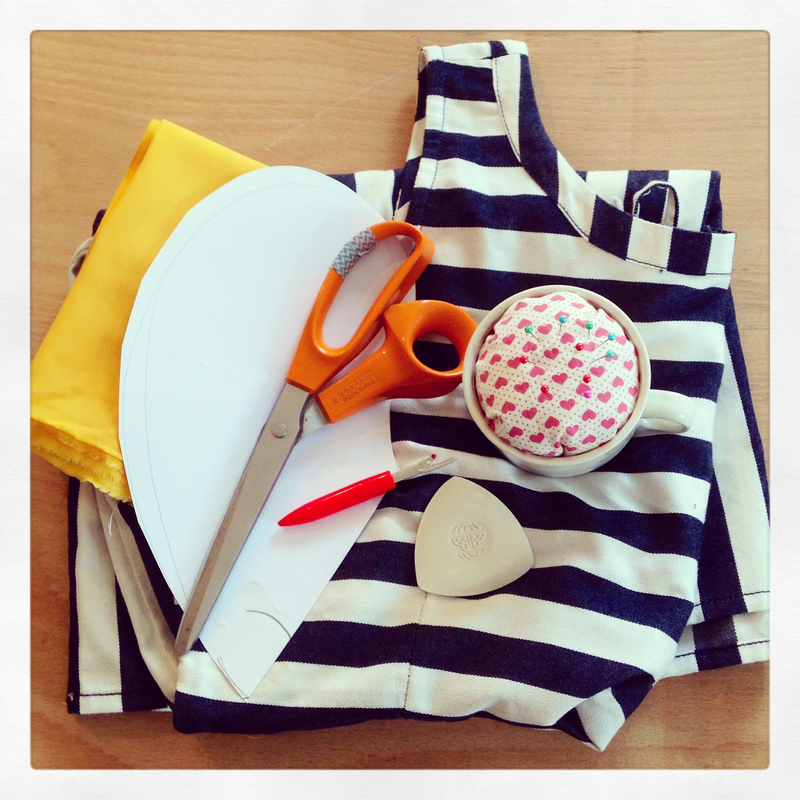 For this project you will need a skirt with one (for one pocket) or two (for two pockets) side seams. 2 – Put your skirt on and gauge where you want your pocket to sit. I have short arms and my skirt has a high waist so for this project the top of my pockets were 15cm below the waistline. Place a pin where you want the top and the bottom of your pocket to sit. (To figure out where you want the bottom of the pocket remember you want the widest part of your hand to fit comfortably through the gap without too much contortion). Measure the distance between the pins. 3 – Draft your pocket piece…: Near the top of your page of A4, on the left hand side mark out the measurement of your pocket opening (in my case, 13cm). Lay your hand across this mark at roughly the angle you see in the picture, making sure your wrist is sitting in the middle or bottom of the pocket opening (your marked line). Draw loosely around your hand. Remember, you want the pocket to drop down enough so that your sweets treasures won’t fall out, but not so much that you can’t reach the bottom. 4 – Cut out 2 per pocket (one right side, one wrong side) adding 1cm seam allowance all around. 5 – Back to the skirt! Using the seam ripper, open the seam between your two pins and about 2cm either side. 6 – This is where it gets tricky to describe, but follow these instructions and the pictures and you should be OK!! Turn your skirt inside out and lay it flat on the table. Take a pocket piece which scoops to the left if the fabric is right side down (make sure the bowl of the pocket is pointing towards the hem of the skirt). Slip the body of the pocket through the split between the pins in the seam on the right of your dress as it lies on the table, and line up the straight edge with the seam. Pin the pocket to the bottom piece of fabric on your skirt (ie, the piece closest to the table) along the straight edge, with the right sides together. Take a pocket piece which scoops to the left if the fabric is right side up, and insert into the pocket slit as before. Pin this pocket piece to the top part of your skirt along the straight edge, with right sides together. Picture 7 is what you should see when you open out the pocket slit (with the skirt still inside out). Looking at your pocket as in this shot you will be looking at the wrong side of the pocket fabric. 8 – Stitch the pocket inserts to the front and back parts of the skirt, where you’ve pinned them together. When you’ve done both, and removed the pins, it will look like this. You sould still be able to get your hand in the slit on the skirt seam. You will still have a gap above and below the pockets. 9 – Pull the pocket body through the gap. Press. Trim the straight edges of the pockets and skirt seam and finish with zig zag stitching. Match the curved edges of your pocket pieces and pin together. Pin the top and bottom of the pocket opening together along the original seam of the skirt. Pin the original seam back together above and below the pocket opening. 10 – Starting at the top of the slit in the seam above the pocket, and with the skirt’s seam allowance pressed out towards the pocket, stitch down the skirt’s original seam line. Once you have stitched over the 1cm seam allowance at the top of the pocket, leave the needle down on the machine and raise the foot. Pivot the fabric and lower the foot again, and stitch all around the curved edge of the pocket, taking care to catch the skirt’s seam allowance at the bottom of the pocket so that it points out towards the pocket. Once you reach the skirt’s original seam line again, raise the foot, pivot the fabric and lower the foot again, and stitch down along the original seam line toward the hem of the skirt. Keep going until you pass the point where you ripped the seam, and the seam is fully closed again. Press. 11 – Trim the seams and finish with zig zag stitching around the pocket edge. 12 – Turn right side out, press and admire. Fill pockets with lip balm and sweeties. Wear immediately.